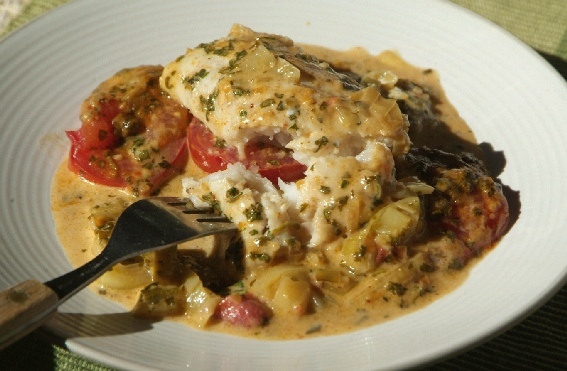 I developed this recipe earlier this week after a client requested a saucy fish dish. I was inspired after last weeks Moroccan explorations, so I decided to experiment with a chermoula, but I love the combination of coconut milk and fish too so I thought combining the two might be fun. I then saw a great recipe on Martha Stewart's website with braised leeks and tomato with fish... and hey presto, this recipe was born. Not much else to say other than both times I have cooked it now, it has met with roaring enthusiasm by it's eaters (and me). 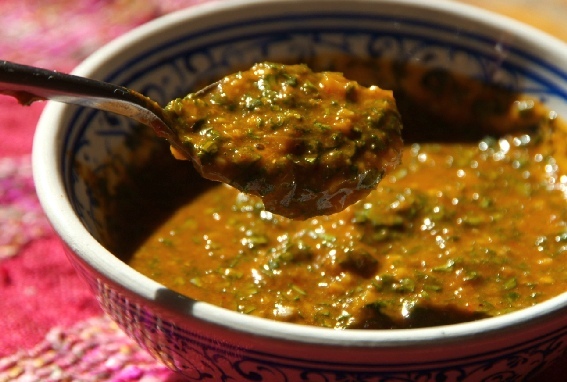 Oh yes, I bet many of you are wondering what on earth chermoula is... it's a spicy herby lemony Moroccan sauce which is great with fish, chicken and veggies. I imagine it would be awesome as a condiment with red meat or added to a marinade. Add a few spoons to a steak sandwich for a flavor sensation! It would probably be great in a salad dressing too. So in other words make double what the recipe calls for below and keep the other half in jar in the fridge! Combine all ingredients, except the herbs, in a blender and blend until a thick, moderately rough sauce is formed. Add the herbs and blend to combine but allow there to be quite a bit of texture left in the herbs. In medium sized not stick pan, heat the oil and fry the leeks until tender. Add a dash of water if the pan becomes too dry. Season with a little salt and pepper. Pre heat your oven on grill and place the wrack in the middle of the oven. In a medium sized casserole dish scatter the leek even in the bottom of the dish. Lay the tomato slices onto the leeks and top each slice with a dollop of chermoula. Place this in the oven and grill for about 5 - 10 minutes. Pat your fish dry and lightly salt and pepper each medallion. Combine the coconut cream and remaining chermoula. Remove the casserole dish from the oven and place the fish onto the tomatoes. Pour the coconut mixture over the fish and bake in the oven for 10 – 20 minutes depending on the size and thickness of the fish. Allow the dish to rest for 5 minutes before serving with rice, potatoes and a salad.